The KTM XC-F line has had stunning success, proving that you don’t need much more than a motocross bike with few key parts to appeal to the off-road world. 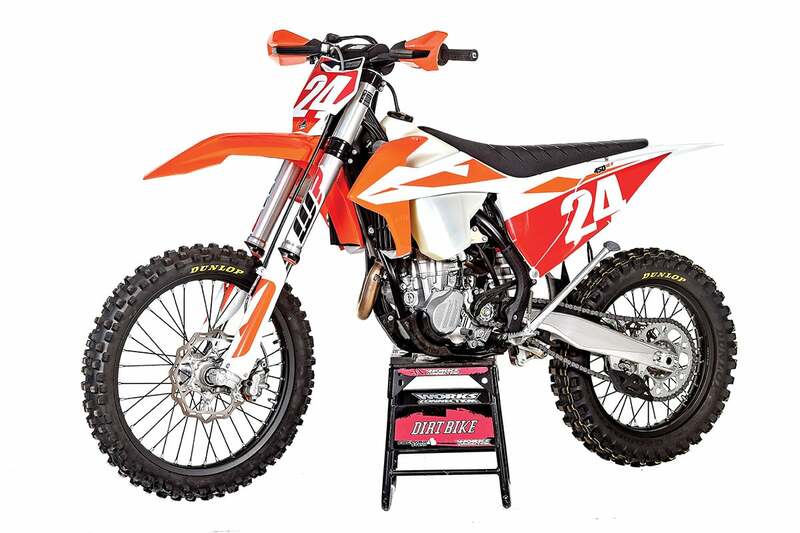 But the result isn’t a trail bike any more than a top-fuel dragster is a commuter, and now there’s a whole class of off-road bikes that are much more at home on a motocross course than on any trail or fire road. In 2019, though, something about the formula has changed. 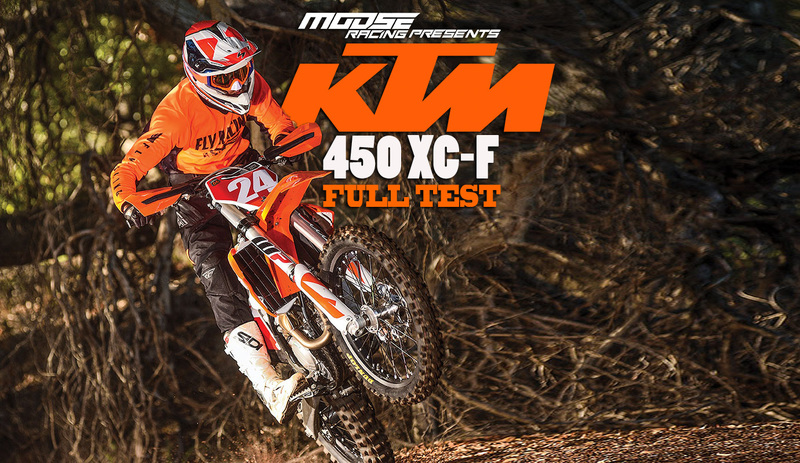 For the first time, the KTM 450XC-F can be a truly great off-road bike. It all depends on what kind of off-road we’re talking about. To be fair, the blurry line between MX bikes and off-road bikes is more of a market trend than anything that KTM has forced. It turns out that most off-road riders want bikes that are fast and light, and that usually means something designed for motocross. Another factor is U.S. regulations demanding that legitimate off-road bikes pass emission and sound regulations, which is an expensive bureaucratic process. From a pure economic standpoint, it makes sense to offer MX and off-road bikes that share as many parts as possible and to bypass regulations by calling them both closed-course competition bikes. Give the people what they want. The 2019 KTM 450XC-F, once again, got all the same changes that the 2019 motocross bike got. On the top of the list is a new, more compact head that is said to be 500 grams lighter. The camshaft provides shorter valve timing and has a different surface. The throttle body has been reworked, and the whole intake system has been slightly tweaked. The radiators are new. The exhaust system is new, and on and on. On top of that, it has a new frame. Even though it doesn’t look any different and it still uses an old-school steel backbone configuration, it’s 10 percent stiffer torsionally and 2 percent stiffer longitudinally. The head stays are now made from aluminum, and the top triple clamp is more rigid. The wiring harness, fuel pump and battery are new. 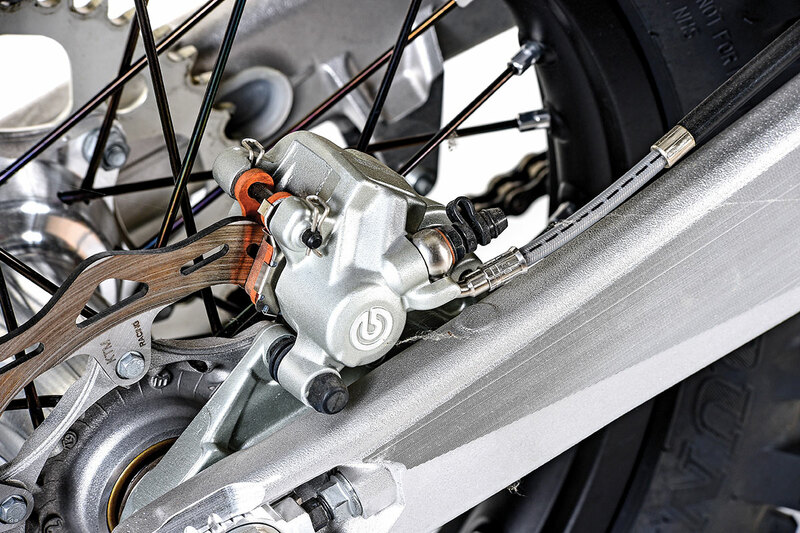 The subframe is longer, and the swingarm has a longer adjustment slot. The most obvious change is that the bodywork is different. As far as the differences between the SX-F and the XC-F, the list hasn’t changed at all. The XC-F has a larger fuel tank (2.3 gallons versus 1.8); it has handguards, a kickstand, different suspension settings, an 18-inch rear wheel, a sealed chain, different tires and a kickstand. There might also be some mapping differences. The bike still has a handlebar-mounted switch that allows access to two maps, launch control and traction control. On our scale, the XC-F weighs 3 pounds more than the SX-F—226 pounds without fuel versus 223. 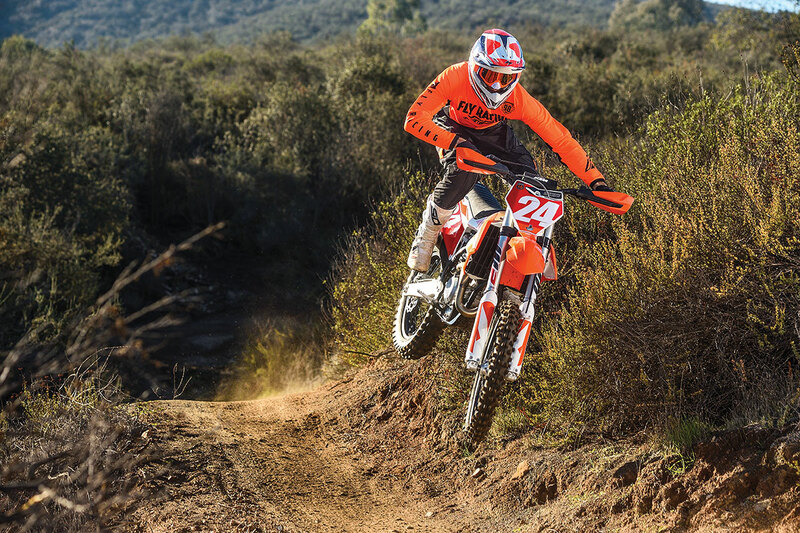 Justin Jones is one of the riders who can use everything the 2019 KTM 450XC-F has to offer. So are those changes enough to make the XC-F fundamentally different from the SX-F? No, but that’s not necessarily a bad thing. First of all, the KTM 450 motor is universally loved. It was, at one point, the horsepower champion of all 450 race bikes. As others have joined the horsepower battle, it seems KTM has stepped back and tried to refine the bike’s existing power delivery. The 2019 450XC-F is gentler and mellower. On the dyno, the bike looks very similar to the 2018 model. They both have torque peaks of around 35 pound-feet, and they both progress to similar horsepower peaks over 56 horsepower. The absolute peak of the newer bike is around a half horsepower less, but that isn’t especially relevant. When you get over 55 horsepower or so, it’s no longer about the peak. It’s about how it gets there, and the 2019 XC-F powerband is smoother than ever. It’s actually deceptive. For the first time in a long time, here’s a 450 race bike that doesn’t make you walk away shaking your head at the excess. 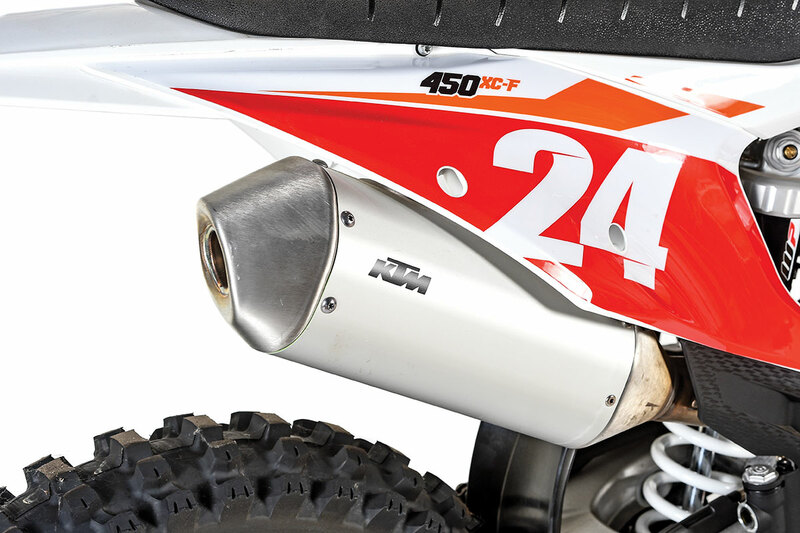 The motor shares everything from cams to gear ratios with its motocross counterpart. One of the reasons that the bike seems so much gentler is simply about throttle response. At small and medium throttle openings, the bike doesn’t reveal its true nature. As it turns out, very few riders open the throttle all the way to the stop. Modern 450s haven’t done anything to make us change those habits, because few riders can hang on at full rage. With the new XC-F, though, the initial reply to your right wrist isn’t especially overwhelming. That allows you to get a little braver and twist a little harder. By the time you get the throttle wide open, there’s no doubt that you’re commanding a formidable weapon. You simply have to learn how to ask nicely. The different maps offered at the handlebar switch are interesting in an abstract sense but have no practical application for riders who really want to alter the power delivery. In some settings, you can’t even tell a difference. 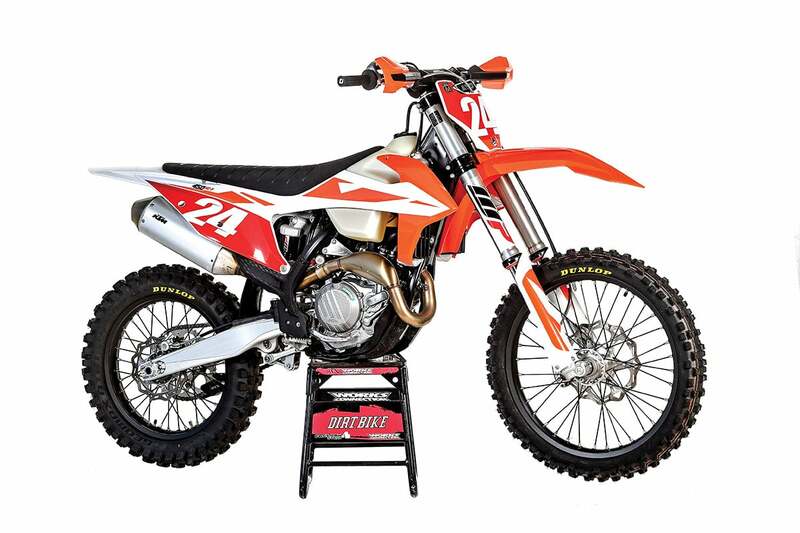 It’s also interesting that two-stroke riders will initially shrug and think that the 450XC-F is no big deal. It has a personality that’s diametrically opposed to what they’re used to. The 450 is a bike that likes a lot of space, whereas most two-strokes are perfectly happy in the confines of a tight canyon. If you choose to rev the 450 and use lots of throttle, it’s simply too much bike for most twisty trails. It’s best to keep the revs low, but then you run into the familiar fear of stalling. The new XC-F almost never flames out, but first gear is rather tall because the gearbox is the same as that of the motocross bike. You learn to ride with the clutch in most of the time. If the trail is really tight, it won’t be long before the bike starts getting hot. Given a chance, it will steam. That’s why the dual-sport version of the bike, the 500EXC, has a radiator fan. Brembo brakes are very strong. Off-road riders can overheat the rear, but it takes a very heavy foot.. The frame is identical to that of the new motocross bike, which is heavily influenced by the needs of Supercross. It’s stiff, but the suspension settings and the 18-inch rear wheel take the edge off of that. 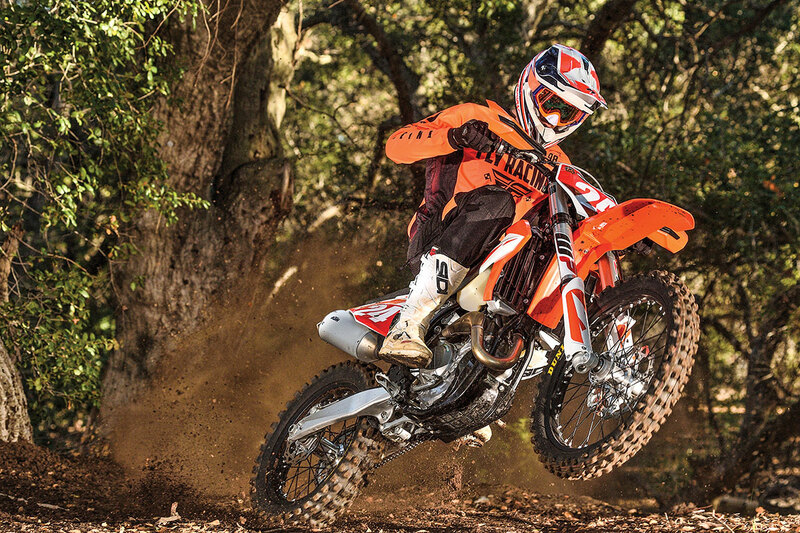 The 450XC-F has a decent ride over small rocks and bumps, but, once again, it’s heavily oriented towards racing. The faster the speed, the better it works. 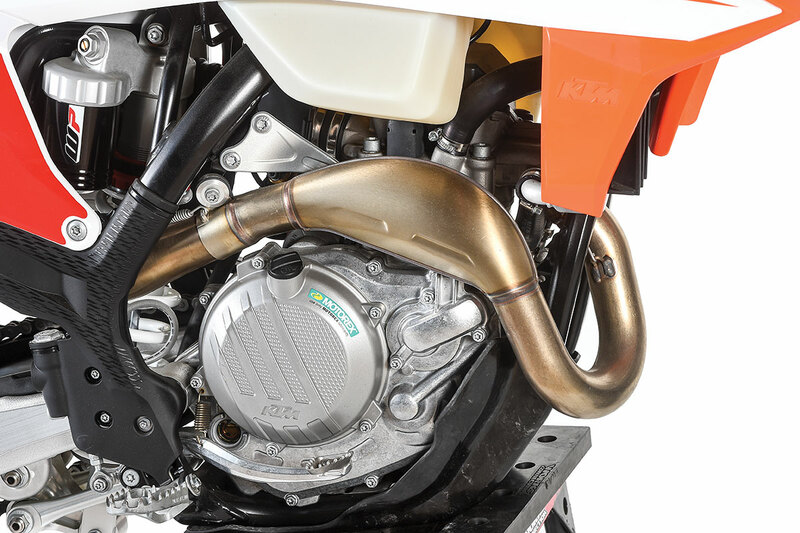 Up front, it uses the WP AER 48 air fork, just like the motocross model, but the recommended pressure is lower: 10.1 bar versus 10.5 (146 psi versus 152). There are valving changes as well, but most riders find that the stock ratings are heavily motocross oriented and run around 10 psi less. Say what you will about air forks, but this is a much better option than buying new springs. You can get by with the stock spring rate in the rear, but backing off the compression damping is mandatory for most off-road conditions. Test riders generally agree that the XC-F has better suspension overall than the SX-F. Part of that is doubtlessly the extra cushion offered by the 18-inch rear wheel. The fuel tank is larger than that of the MX bike and is made of translucent material. The WP AER 48 fork works well, is reliable and is easy to tune. There’s still no escaping that this bike was designed first and foremost with motocross in mind. The factory didn’t say no to Marvin Musquin in order to please off-road riders. Still, it’s interesting to note that the needs of motocross and off-road can often overlap. The power delivery is right, and the suspension and handling are perfect for some types of off-road riding. What types? It’s all about average speed. The faster you expect to go, the better the XC-F will perform. Out west, it’s a natural for MX/off-road hybrid races like the NGPC and WORCS. There are certainly a lot of riders who campaign 450s in GNCC races as well, and now their task is easier than before. The 450XC-F is the one bike that comes closest to bridging the gap between east and west. As always, it all depends on your personal definition of off-road. The muffler is new but offers no spark arrestor. It’s quiet for a motocross bike but loud for an off-roader. Running weight, no fuel 226 lb.